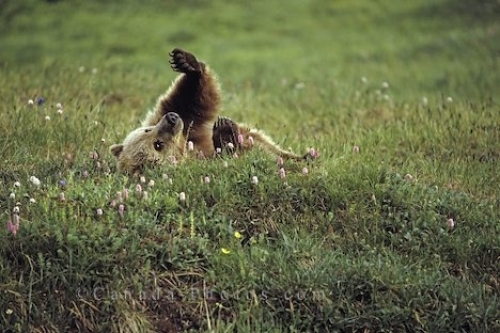 A Grizzly Bear playing and having fun in the grass in Denali National Park, Alaska in the USA. This cute grizzly bear having fun by himself as enjoys the sunny day in the grass in Denali National Park in Alaska, USA. A wild grizzly bear looks like a big teddy bear while he plays and has fun but can stand his own ground if he feels threatened in any way. Grizzly bear playing in Denali National Park, Alaska, USA, North America. Picture of a grizzly bear having fun rolling around in Denali National Park in Alaska, USA.